This article is about the community in Washington County, Utah. 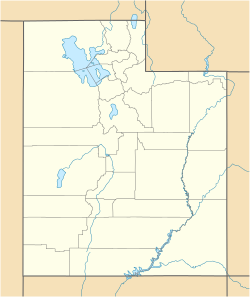 For the town formerly called "Central" in Sevier County, see Central Valley, Utah. Central is a census-designated place in northwestern Washington County, Utah, United States, on the edge of the Dixie National Forest. The population was 613 at the 2010 census. Central lies along State Route 18 north of the city of St. George, the county seat of Washington County. Central has the ZIP code of 84722. Central is the starting place of the annual St. George Marathon. Central was settled before 1910. It became an incorporated town in 1935, but was disincorporated in the 1960s. As of the census of 2010, there were 613 people residing in the CDP. There were 344 housing units. The racial makeup of the town was 96.1% White, 0.5% American Indian and Alaska Native, 0.8% Asian, 1.8% from some other race, and 0.8% from two or more races. Hispanic or Latino of any race were 3.6% of the population. ^ a b "Central, Utah". Geographic Names Information System, U.S. Geological Survey. http://geonames.usgs.gov/pls/gnispublic/f?p=gnispq:3:::NO::P3_FID:2629947. Retrieved May 25, 2011. ^ a b "American FactFinder". United States Census Bureau. http://factfinder2.census.gov/main.html. Retrieved May 25, 2011. ^ Rand McNally. The Road Atlas '08. Chicago: Rand McNally, 2008, p. 102. ^ "Census of Population and Housing". U.S. Census Bureau. http://www.census.gov/prod/www/abs/decennial/. Retrieved November 18, 2011.